Baby Driver is now showing in cinemas everywhere and is distributed by Sony Pictures. Edgar Wright's magnum opus, Baby Driver is the action packed cinematic dance that has shattered it's genre confines with it's creativity, originality and it's creator's obvious passion. From the very beginning, Baby Driver is demanding of your full attention and there is nothing dissatisfying about this. 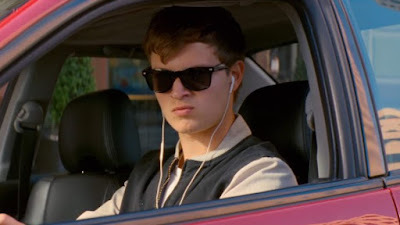 The film opens with Ansel Elgort's Baby pulling his car up outside of an Atlanta bank, ready for his passengers to begin their heist. The heist soon turns into an high speed car chase as they speed away from the bank with "Bellbottoms" by The Jon Spencer Blues Explosion playing loudly. Not only is this the best opening scene you will see this year, but it sets the tone for the film perfectly and gives you a taste of what to expect. Wright's film is the result of a long time passion project that has finally seen the light of day and is anything but self-indulgent in the way that filmmakers passion projects can often be. This action film with his unmistakable brand on comedy is by no means a traditional film. While most films have a soundtrack to accompany it, Baby Driver is a story told by means of it's soundtrack. Each scene is carefully choreographed to the song that it is accompanying and it is a joy to watch how Wright has directed these scenes, especially the "Hocus Pocus" chase scene, "Tequila" shoot-out and explosive "Brighton Rock" scene. The visuals and cinematography are also particularly Wright-esque with close-ups on objects as they are utilised, which fits perfectly with the rhythmic feel of the film. Baby Driver also uses these objects and the soundtrack as symbols to mix the modern with the nostalgic at various points throughout the film. As Baby listens to "Harlem Shuffle" by Bob & Earl as he gets coffee for his accomplices, the film has a particularly 1970's feel about it. Throughout the film, we see items such as a Polaroid camera and an iPod in the same scene which is a contradiction of time periods. We also see Baby listen to vinyls and tapes, but also listen to his iPod continuously. All of these images make Baby Driver into a film that will remain timeless, as it combines the old and the new rather than working with one specific time period. 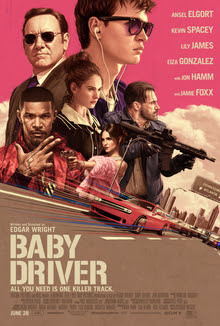 While music is a major driving force (excuse the pun) behind the film, Baby Driver focuses a great deal more on character than any other of Wright's films before it. There is not one character in the film that the viewer feels they do not know at least a little about (the only exception here being Jon Bernthal's Griff). The lead character of Baby is exceptionally fleshed out, with not a doubt being left as to who he is, what his motives are and what lies behind the quiet exterior. We come to know him and experience his ordeal with him. One of the most interesting things about the film is how unexpected character reversals take place. Baby Driver isn't completely unpredictable, but what is unpredictable is the direction certain characters take. The people you believe are going to be the villains turn out to be the good guys and the good guys turn into the bad guys. Jon Hamm's Buddy and Kevin Spacey's Doc are perfect examples of this. Yet, perhaps the most interesting character is that of Darling, as portrayed by Eiza Gonzalez in her breakout performance. Although her exterior may be perceived by some people to be the opposite of feministic, she could well be the strongest person in the film. As well as being his wife, Darling is Buddy's femme fatale and the Bonnie to his Clyde. Not only that, but she is his strength and she keeps him grounded. There is no doubt that Buddy is a dangerous human being, but he is far less dangerous with Darling around. And if she asks him to do something, he will do it. Darling also refuses to be intimidated by anybody else, which at the end of the day has nothing to do with her husband. She's an incredibly strong character and more emotionally in control than any other character in the film. Baby Driver is highly entertaining and often confronting with it's insane car chase and action sequences, but it is definitely not a straight forward genre film by any means. It is an incredibly unique production that breaks down barriers and is a stunning cinematic work of art. Kevin Spacey really was a great actor. I'm sure this would be good too. It sure is sad all the scandal that involved him recently. Great article. Actually, All education in western countries is overseen by the federal government but the onus is on provincial governments to govern funding and academic regulations, which vary widely from one province to another and know more from movies on 2008.